Sub-titled ‘A Spiritual Journey Through Seven Mystical Windows’, this is the second collection by Manchester author Mansoor Shah of esoteric poems in the Sufi tradition. An academic by day, Shah describes his heritage as a product of the Ottoman Empire and is following in the great traditions of Sufism, his work suffused with its religious and philosophical underpinnings. 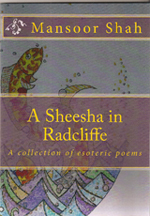 Specifically, Shah – who lives in Radcliffe, hence the title – draws upon the influences of great Sufi authors such as Rumi, Jamie and El Arabi. With illustrations by local artist David Vaughn which reflect his Celtic heritage, the collection makes for an arresting and thought-provoking read. Taking inspiration from everyday life, Shah’s poems in many ways mirror haiku poems in their restraint and economy. For anyone perhaps put off by the word esoteric, Shah’s poems are surprisingly accessible. Shah encourages individual interpretations of the poems, the sheesha of the title reflecting each person’s own window on the world.